Several years ago while I was working at my desk updating patient files, a thought occurred to me. I had just finished opening the day’s mail, complete with many holiday cards from various vendors. Most of these cards were printed, no personal touch and very formulaic. They didn’t inspire much in the way of warm fuzzy feelings for the season and in fact quite the opposite. I wished these companies hadn’t bothered with cards as I doubted many customers found them particularly meaningful. I began to ponder all the money that was spent by businesses throughout the world on an annual basis, the intent of which was to acknowledge their existing clients. We had been doing the same thing for years. I thought that there must be a more productive way to spend these dollars. After all, in the true spirit of the season we should be giving of ourselves to brighten the lives of others. Yes a card may put a smile on someone’s face but imagine how valuable the many dollars spent on cards and postage could be to a worthy cause year after year. That was the last time, more than twenty years ago, that we sent out holiday cards to clients. Instead we calculated what was spent in cards, postage and time in sending these out. As expected it was several thousand dollars and that was the day our holiday habits changed. 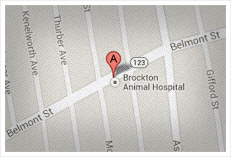 As most businesses are approached several times yearly by worthy non-profits, Brockton Animal Hospital is no exception. We sifted through the many requests for contributions that we received and identified those that we thought were the most important in the lives of others. Next our hospital administrator looked in to each organization to assess how much of every contributed dollar actually is dedicated to the cause rather than salaries, promotions and expenses. We consulted our staff since these gifts were from all of us and made our decisions. Since social media was in it’s infancy when we first started this giving, we placed an ad in the local newspaper to wish our clients a safe and happy season. We also posted the names of the non profits who were the recipients of these gifts on behalf of our clients. As far as we were concerned it was a win-win situation. Our clients were acknowledged for their for their dedication and we felt that the money was spent in a far more beneficial way. Over the years our contributions have benefited homeless adults and children, single parents, young people growing up in challenged environments, kids requiring tutoring to achieve, AIDs patients, cancer patients, Make a Wish children…..the list goes on and on. With the accessibility of social media we no longer need the newspaper posting. A simple framed poster in our office greets our clients and lets them know where this year’s contributions have been sent (including the cost savings from the newspaper). So to all of you this year, our clients, our friends and especially our pet companions, we wish you the Happiest and Healthiest Holiday ever. Please take a certain credit for the good that comes from the abovementioned. Without all of you none of this would be possible.